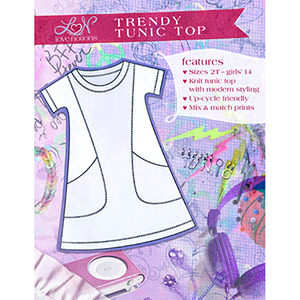 The Trendy Tunic will soon be a staple in your daughter's closet. Made with knit fabrics, the tunic length top has simple lines, inset pockets and short cap sleeves. Pair it with tights, leggings or jeans and you're ready to go! Dress it up, dress it down, use bright, fun prints or do a little color blocking. You can even upcycle adult graphic tees! It's versatile, fun and modern. Upcycle friendly! This is the girls version of the Trendy Tunic. This pattern comes with sizes 2T to 14. 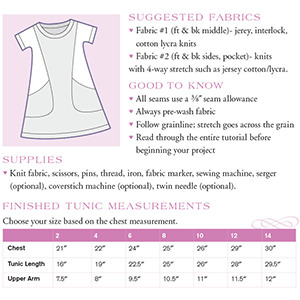 Suggested fabrics are light to medium weight knits such as cotton jersey and cotton lycra.